This is one of several essays dealing with dialogs. Another one discusses the issues of control management, and one discusses issues of menu management, printing from a dialog, and resizable dialogs. There are a large number of recurring questions on creating dialog-based apps. This is my method of creating dialog-based apps, and in addition, illustrates how to handle the Enter key in an edit control. The most common problems people ask about are "How do I trap the ESC key so it doesn't terminate my application?" and "How do I trap the Enter key so it doesn't terminate my application?". These are easy. First, I do not believe in handling this in PreTranslateMessage. The result of this is distributed knowledge which makes it difficult to maintain the code, particularly when controls are added or deleted. My technique uses subclassing to put the intelligence where it belongs, in the control, and puts the handlers in a known and easily understood place, a message handler. Enter the ClassWizard. Select IDOK and its BN_CLICKED handler, and click Add Function. Accept the name it gives. Do the same for IDCANCEL. You should end up with something that looks like the illustration shown below. I show the IDCANCEL handler clicked, since that is the last one I added (note that two lines below, the ON_IDOK::BN_CLICKED handler is already present). Next, select the dialog class, and find the WM_CLOSE message handler. Click Add Function. You should now have something like I show below. Change it to be as shown below. Delete the bodies of OnOK and OnCancel. Put the CDialog::OnOK call in the OnClose handler. Go back to the dialog. Delete the OK and Cancel buttons. Add in your controls. For example, I want to add an edit control that reacts only when you either leave it or hit Enter, and prior to that it can be changed without any effect. The other control reacts immediately. In VS.NET, this is done by right-clicking on the control and selecting Add Event Handler. Also, create a member variable for the control; I describe how to do this in a companion essay. In order to access the status control which will show the effect, you must assign it an ID other than IDC_STATIC. Create a control variable to represent it. As each character is typed in the "Immediate Reaction" edit control, it appears in the box labelled "I see". Create a class derived from CEdit, which I have called CEnterEdit. 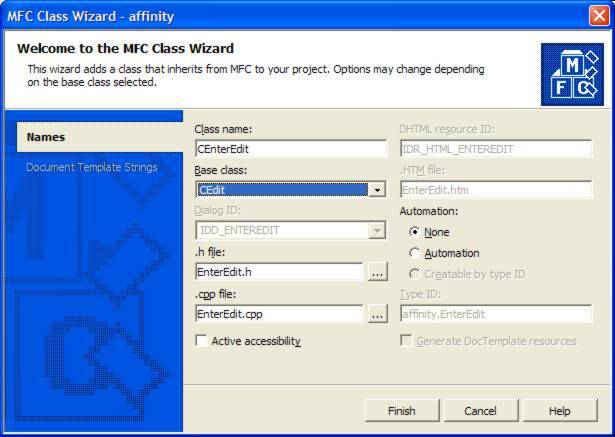 You will then have to select what kind of class, and the selection should be "MFC Class"
You can then supply the name of the class and select the base class. Now create a member variable for IDC_DELAYED of that type. In VS6, you will go to the ClassWizard, select the Members tab, and ask to add a member variable. In VS.NET you will right-click on the control, and select Add Variable... In VS.NET, you don't even have the option of having the known immediately-derived classes available to you in the dropdown; you have to type in the name of the class. Like a lot of the VS.NET IDE interface, this change was apparently made to make it as difficult as possible to actually get work done. It doesn't help the usability that after each variable addition, you are switched to the source code of the module, as if this makes any sense whatsoever, since there is absolutely nothing you can do in the source at this point that is interesting. Typically, you want to add all the variables, and then go edit the source. In ClassWizard select the new class you defined. (Note that if you are continuing from the previous step you will be prompted to save your changes; select "Yes"). Otherwise, you will get compilation errors whenever your ...Dlg.h file is processed. If you use a custom message, you must define it. I prefer to use Registered Window Messages, as outlined in my companion essay, so I added to EnterEdit.h the following declaration. Note that it is critical that when you add a user-defined message, you document its parameters, effect, and return result! Doing anything less will lead to unintelligible and unmaintainable code. I declare it in EnterEdit.cpp as shown below, or you could use the more convenient DECLARE_MESSAGE macro I define in my companion essay. This allows me to write the handlers I need. This tells the dialog superclass that when focus is in this control it should deliver to it all the keys pressed. Why a switch with only one case? Why not? It makes it easy to add other cases, and captures the fact that you are concerned at the moment with some finite set of characters. I prefer switch statements in such contexts. They eliminate the temptation to add complex if-then-else structures, resulting in cleaner and easier-to-maintain code. When an Enter key is seen, the message is sent to the parent which can then react to it. IMPORTANT: In VS6, this should be outside (above or below; I show above) the magic AFX_MSG_MAP comments! Otherwise you can confuse the ClassWizard. in VS.NET, there is no such requirement. IMPORTANT: In VS6, this must be outside (above or below, I show above) the magic AFX_MSG comments. Otherwise you can confuse the ClassWizard. In VS.NET, there is no such requirement. Note that in VS.NET the handler methods are all declared as public. There is no possible way it could ever make sense to have these methods be declared as public. Edit the header file and make them all protected. Good programming practice in C++ is to minimize the number of public entities in a class. Only those variables and methods which would be accessed from outside the class should be public. Control variables and handler methods would never be accessed from outside the class (and if you are doing this, you have committed a grievous error. Rewrite your code). In this simple example, I don't care which window generated the message, so I ignore WPARAM, and whatever control was activated, I simply set its text into the status window. In a dialog with many controls, you would probably want to switch on the WPARAM value. Now when I run the app, and type text into the "Delayed Reaction" box, I see the following. Note that the contents of the "I see" status box is whatever was left from the previous typing. but if I hit Enter or change focus, I will get the following result. The new text is in the "I See" box, and the focus (as shown by the caret) is still in the Delayed Reaction" box. Or, if I switch focus, I will also see the effect. Note that by doing this on a kill focus, I will also see the text activate if I switch to another application. If this is not desired, don't use the =EN_KILLFOCUS reflector, or you must do a more complex test. Note that starting from the first picture, I get the result shown below when I change focus to the upper window. Many people have commented on this technique, "You are creating another subclass. Why do you feel you need to do this?" Never be afraid to create a custom subclass. I have been known to create a dozen in one day. It is a natural paradigm for MFC programming. These are the techniques I use to build real software that is used by thousands of people and maintained by someone other than myself. Download the code sample I used to create all those windows. Sometimes you want your app to come up as a tray icon app, with no actual visibility when it starts up. There are two issues involved here: preventing the initial "flash", and creating the tray icon and its associated menu. When a dialog-based application comes up, the dialog manager normally forces it to be visible. The usual solution I used was to put up with this, and do a PostMessage of a user-defined message in OnInitDialog which, when finally processed, would hide the application. This meant the dialog would initially "flash" on the screen. This is visually disturbing. All of these are useful techniques, and I highly recommend this article. The trick (one I would probably have never discovered on my own) is to use the WM_WINDOWPOSCHANGING message. // when the mouse hovers over the icon. A corresponding routine is required to unregister the tray icon. If you don't unregister the icon, you will end up with multiple copies in the tray, and they will appear to spontaneously disappear when the tray is activated (if you normally keep it hidden), which is an ugly effect. Expect this to happen naturally if you are debugging and simply terminate the program in the middle of debugging. You then add the code to the .cpp file. Note that the wParam value is not needed. In this code, a double-click is designed to pop the window up, and a right-button click will pop up a menu. The popup menu handler requires a couple tricks, which are documented in KB article Q135788. Generally, it looks like any other way you would invoke TrackPopupMenu on a right-click, except for the special actions required by the KB article. You will simply add ordinary menu-handling methods using the ClassWizard, and create the menu using the ordinary menu-editing capabilities of the resource editor. SetForegroundWindow(); // See KB article Q135788! PostMessage(WM_NULL); // See KB article Q135788! A menu can be easily added to any dialog. 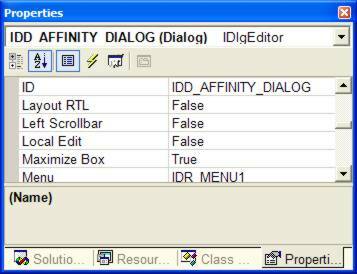 Simply go to the Properties of the dialog and add the menu ID. Also, see below the erroneous advice that a "thin" border is mandatory for a menu to work. This advice is nonsense. A dialog can have a menu independent of its border size (thin, dialog, or resizing). There is a problem with adding a menu to a dialog box, if you are trying to use CalcWindowRect to compute the size of the dialog box to hold a specific size client area. CalcWindowRect fails to take into account the presence of the menu bar. See my essay on MSDN Errors and Omissions for the solution to this problem. 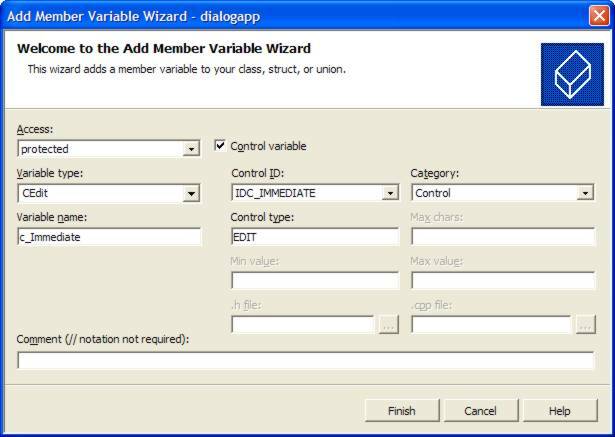 If you dialog has a menu, you'd like to use accelerator keys to activate some of the menu items. For example, Ctrl+S to save a file, Alt+F4 to exit the program, etc. The problem in dialog-based apps is that the MFC framework necessary to process these is missing. There is a KB article, #100770, which is almost right, but it introduces a lot of fundamentally-not-best-practice mechanisms. So this essay discusses how to add accelerator keys without violating good practice. It is loosely based on KB100770, and I'll show where it differs. First, note that in step 3, it says that the border style must be specified as "Thin". It says "This step is required for a dialog box that contains a menu". It suggests that other border styles will not work. This is simply not true. I use this technique with a resizing border and it works just fine. What it apparently meant to say was to not use a Dialog border. I will skip over the steps where you create a menu, the individual menu items, and the accelerator table. Presumably anyone sophisticated enough to care about this issue already knows how to do that. The first major difference with KB 100770 is the use of global variables. They are not necessary. The article advises two points which constitute something fairly distant from "best practice": the use of global variables, and the editing of stdafx.h to hold project definitions instead of just stable library definitions. Neither of these steps are necessary, and appear to be the result of an amateur translation from a pure Win32 program to MFC by someone who did not really understand MFC. In addition, this violates various hook requirements. If the code is < 0, then no further processing should be done. So the return statement is required where indicated. Note that VS.NET erroneously declares this method as public in the header file. There is no possible way it could ever make sense to declare this method public. Edit the header file and make it protected. You may be dismayed to discover that in spite of this, your shortcuts don't work. For example, supposed you use Alt+F to activate the File menu. But the file menu doesn't drop down? What went wrong? The glitch here is that you have some control on the dialog which has an underlined F as its activation, e.g., Find or Fixup or something like that. If you have a control which has the same shortcut as a menu item, the control will take precedence. 20-Apr-08: Added reference to CWnd::CalcWindowRect problem if there is a menu in the dialog.